The twilight of a season and the twilight of a career are upon us. As the Marlins come to town as the worst team in the National League, perhaps the baseball gods will allow David Wright to play hero one last time. In a series about endings for the Mets, this is also a look to the future for the Marlins. Pieces of their youth movement have begun their major league journeys, and their next few seasons will go a long way in determining whether the woeful ways of Marlins baseball have started to change. For the last time in 2018, this stat preview focuses on the Marlins’ future with a nod to the Mets’ past. 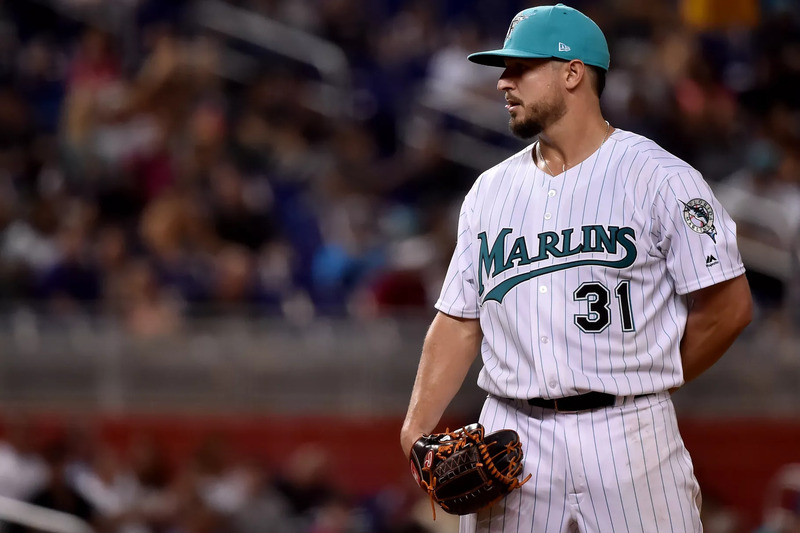 Sandy’s Sunrise: The wave of talent that the Miami front office acquired over the offseason has started to reach the highest level, and Sandy Alcantara was perhaps the biggest pitching prospect in that first wave. The 23-year-old righty has struggled mightily with his command in his brief cup of coffee (21 BB to 20 K), but one encouraging sign is his ground ball rate, which has trended up in both the minors and majors (44.8% last year in Double-A, 49.4% this year in Triple-A). That could help explain his low BABIP at both stops this year (.283 in Triple-A, .243 in MLB), but the MLB number shows why his FIP is much higher than his ERA (5.65 to 4.00). Statistically, it seems like Alcantara has a ways to go before he becomes a major league quality pitcher, but his walk numbers should regress and help bring him more success. Anderson After All-Star Break: Brian Anderson has been talked about in most NL Rookie of the Year conversations as a guy who had a good-not-Acuña/Soto season. The reason Anderson has not been able to keep pace in the awards race, though, is due to stagnation in the season’s second half. Through the All-Star break, Anderson had a slash line of .288/.363/.429. After the break, it fell to .245/.343/.348. The drop in production caused him to go from top five pace in WARP among right fielders (about 4.5 WARP/600) to bench-level pace in WARP over the season’s last two months (about 1.0 WARP/600). Perhaps the long season played a factor, as Anderson has received about 70 more plate appearances than any previous year. Regardless, the Marlins need the first half version of Anderson to build around in the future. Sierra’s Struggles: In the same trade that netted the Marlins Alcantara, they also received the speedy outfielder Magneuris Sierra, whose first season in Miami may be one he wants to forget; Sierra has been worth -1.1 WARP in just 148 plate appearances. That’s worse than Chris Davis’ pace, and he is the least valuable player in baseball by almost two full WARP. Sierra’s ISO of .014 — yes .014 — is the lowest among any batter with at least 100 plate appearances this year. While he will probably never be an offensive thumper, those levels of ineptitude will not be playable on a winning team. The Marlins certainly hope he turns it around, but the early returns are not looking good. The Good: J.T. Realmuto finishes as the best catcher in baseball with 6.11 WARP. He’s also the ninth best position player by WARP, regardless of position. The Bad: Miami’s offense has scored the fewest runs with 581. The Mets have scored 669, 10th worst. The Ugly: Miami has only hit 128 home runs, again good for worst in baseball. The three former Marlins outfielders that were traded away in the offseason have hit a combined 91 home runs. 6,689 plate appearances. 1,777 hits. 242 home runs. David Wright was and is a living legend. Numbers alone cannot describe what he has meant to this franchise, but here they are: Wright is the all-time franchise leader in hits, runs (949), total bases (2945), singles (1119), doubles (390), RBI (970), walks (761), times on base (2583), sac flies (152) and just about every measure of WARP or WAR. These last few years have been weird without you, but I am glad to see you play one last time. Thank you, David Wright. Thank you, Captain.